Want to get theatrical? 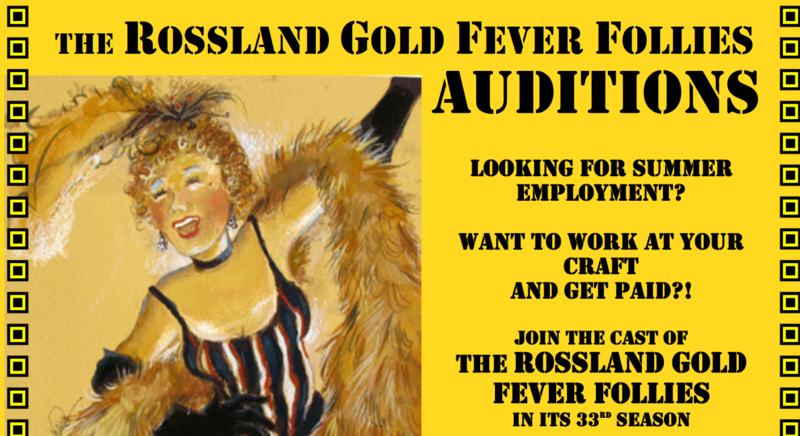 The Gold Fever Follies has begun a search for actors, especially those with singing and dance skills, for the 2019 show. Interested people need to sign up for a time slot to audition, by contacting Lisa Henderson. Scroll down to see the text contents of the auditions poster; more information is also available below – keep reading! Meanwhile, enjoy the Rossland Winter Carnival Variety Show at Rossland Summit School (RSS) on Thursday, January 24. The show will feature the Boomtown Garter Girls and many other displays of talent , with pre-show tunes by the Golden City Fiddlers. Doors open at 6:30 pm, and the show is scheduled to begin at 7:00. Advance tickets for the Variety Show are a mere $8 each for adults, or $6 for seniors and students, or $23 for a family of four; available at the Rossland branch of the Nelson and District Credit Union (NDCU), or at Curiosity Clothing & Gifts (across Columbia Avenue from the Subway). Tickets at the door are all $10 each, or $30 for a family of four. Many thanks to the NDCU for sponsoring this show! Proceeds will help keep the Gold Fever Follies playing an important part in Rossland’s rich cultural scene, and will also help the RSS Drama department. How did the Gold Fever Follies begin? The Gold Fever Follies have been part of Rossland’s fun and creative life for about 33 years now. Their website tells us that a small group of theater enthusiasts, headed by Ray Furlotte, started a musical revue based on Rossland history, way back in 1987. The show was based on local lore, and embellished with old time tunes and real cancan dancers from the Boomtown Garter Girls. Over three decades later, the Rossland Gold Fever Follies, headed by local resident and current Follies President Lisa Henderson, are still going strong with original stories from Rossland’s rich gold mining history. Considerable artistic license is used, so audiences should not take events from Follies productions as historically accurate, but the stories are based on nuggets of historical fact, and many Follies characters are based on real people from Rossland’s past. Such characters have included Judge Begbie, Father Pat, the Hunter Brothers, Olaus Jeldness, Big John Kirkup and a host of others. Originally, the actors were nearly all talented local high school students getting some of their first experience of performing on stage in an ongoing production. In 2007, Nadine Tremblay was selected as one of the actors, and with her encouragement and contacts, in 2008 the Follies began seeking actors from post-secondary theatre programs to augment the supply of local actors available to spend an intense summer on stage. Looking for summer employment ON THE STAGE? and Featuring the BOOMTOWN GARTER GIRLS!